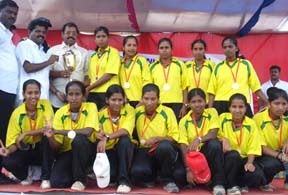 10 Oct :Goa women team and Jharkhand men team emerge WINNERS in the 19th Senior National Tennis Ball Cricket Championships held at Tiruttani, Tamilnadu.Goa women team defeated Chattisgarh in the Finals held on 8th Oct. 2008 . under strong local crowd. Sharon Dias ( India Captain/International) outclass in the final and throughout the championship to clinched the Women of the match and Women of the series in the 19th National championships. Utter Pradesh defeated Jharkhand women team to clinched the 3rd place in the championhip.Final Scores:- Batting first Chhattisgarh scored 35 runs in allotted 8 overs with Reshma and Kumudin scoring 10 and 9 runs repectively, For goa Ruby Sakhalkar took 3 wickets for 3 runs, sharmila and Pratima took 1 wicket each. In reply Goa scored the required runs in 3.5 overs with Sharon Dias scoring 24 runs(not out), sharmila Naik and Dhanashree Naik scoring 4 runs each.Thus Goa averted the loss they secured in the finals last senior national championships at Agra where they had lost to Andhra Pradesh.Thus Goa teams has become the undisputed champions of India and have so far won 4 senior nationals and 1 runner-up and 1 3rd place in the last 8 years of participation. Goa team was led by Gauri Kundaikar of Goa Police and Nilesh Naik was the coach .In the Men section. Jharkhand defeated Jammu and Kashmir in the finals to clichéd the men title. Vidharba defeated Dadra & Nagar Haveli to clinch the 3rd spot. The successful teams were awarded trophies and momentos and medals to the players at the guest present during the prize distribution function.The championships is organised by Tamilnadu Tennis Ball Cricket Association under the banner of Tennis Ball Cricket Federation of India at Tiruttani District of Tamil Nadu. Goa women team will receive 1.3 lakhs from the sports authority of Goa as prize for winning the prestigious national championship. Shri. Kanta Naik, President, GTBCA, Ropesh Naik, Secretary, GTBCA, Shri. V.M.Prabhudessai, ED, SAG , Navin Acharya, Asst.Secretary,SAG has congratulated Goa women team for their success. The winning team will reach Goa on 11th Oct. 2008 by train at 2 pm at vasco.